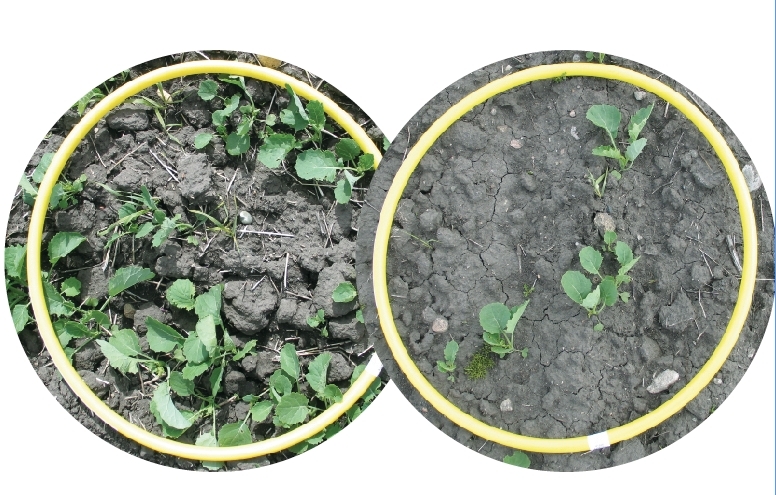 A one-quarter-metre square hula hoop shows the difference between 8.6 plants per square foot (left) and 2.2 plants per square foot (right). Seed lot variability can mean inadequate seeding ratesDonna Fleury Variation in seed lots can have a major impact on seeding rate and yield potential. When seed lots vary in TSW, then growers should calculate the seeding rate for each seed lot separately. “In a recent example, one seed lot weighed 3.5 grams and the second weighed five grams per 1000, so you need to calculate the right seeding rate for each individual seed lot,” explains Hammond. Using a 50 percent seed survival, the 3.5 gram seed lot would need a seeding rate of 4.7 pounds per acre to achieve the minimum plant stand of seven plants per square foot. With the larger seed size of 5.0 grams per 1000 seeds and a 50 percent survival rate, a seeding rate of 6.7 pounds per acre is needed just to achieve the minimum plant stand of seven plants per square foot. However, a recent survey suggests many growers are using a 5.0 lb/acre seeding rate or less on average, which means they would need a minimal survival rate of about 70 percent to achieve that minimum plant stand. For more information, go to: https://canola-council.merchantsecure.com/canola_resources/product34.aspx. Collecting seed from several drill runs over a measured distance in the field at the speed planned for seeding is a good idea to confirm settings and rate, as equipment bounce or age and wear can lead to over- or under-application, which can be costly both in terms of seed investment and yield potential. Recalibrate drills when switching between canola varieties or seed lots with substantially different TSW.